View Poll Results: What would Eddy do? Blinged out CAAD9, worry about power later. Entry level carbon, worry about power later. So I'm gearing up for my first season this spring and looking to purchase my first race bike. My current road bike is more of an audax bike (triple, fenders, lots of steel, relaxed geometry, too pretty to crash, etc.) so using the current bike is out of the question. I've been riding road for a few years now, and am ready to commit to a serious bike. That said, it'd be nice to stick with campy 10 speed components for backup parts and compatibility, but shimano isn't out of the question. Willing to invest a max of $2500, saving would be nice but spending is not a problem. 1. Stock CAAD9 5 - swap the saddle and seat post, shut up, and race it already. Use the money for races, fitting, personal trainer, etc. 2. Stock CAAD9 5 but lace up a PT pro. Personally I think I need a season in my legs of doing the wrong things in order to appreciate the right ones with a Powertap, as well as learn limiters, etc. 3. CAAD9 frameset, 09 centaur carbon components, lighter seatpost, cockpit/ This would take somewhere in the range of 600-800 grams off the bike, and I like the shifting better. I'd get a PT next year which can be used on both bikes. This would be nice for bad weather training. Also, blingity bling bling bling. 4. Buy an entry level carbon frame, worry about the PT next year. Possiblities include the Giant TCR Advanced 3, Cannondale Six, Orbea Onix TDE, Specialized Tarmac elite. Cannondale seems to be the only one with a solid crash replacement policy, the crash 5's certainly worry me. A higher end frame might be a better purchase after the powertap. I thought you weren't really planning on racing yet? Well, I say stock CAAD9 with no PT, mostly because I have no perspective on the amount of money someone with a "real job" (is being a grad student a real job?) can spend on a bike. If you're really serious about it, a PTap is a good idea. Stock bike with a good raceable PT wheel. Deep profile clincher, for example, so you can train on it as well as race on it. A tall rear wheel is rideable in all conditions. If you can use your old front wheel, you can sell the new wheelset off your bike, easier to sell as a new pair than as a used pair or as a broken up pair. Work on fit - seat, perhaps post, stem, bars. Get good ancillaries - Pedals. Tires. Replace wear parts with more durable things as they wear - chain, cassette, chainrings. You could probably keep the brakes for 10-20 years. For riders with a quiver of race/training wheels, I don't recommend a PT. But for someone getting their first bike, I think a raceable/trainable PT wheel is good. Their stock software (a couple years ago anyway) works fine. You want to race and train on the wheel, else you won't know what you're doing in one or the other. I've been saving for a while and debating about spending it on bike stuff or not. Finally made a decision last week and started researching. When your rent is $330/month, car is paid off and you don't have any debt then being a grad student in engineering can be a 'real' job. This is good advice, I forgot about using the other front wheel. That could save some money. I think the stock caad9 and powertap is the way to go. Amazon.com is sending me Coggans book on power, should be here Tuesday. Read the book before you buy the power meter. If you finish the book thinking "wow, that's cool stuff!" then buy the PM. If you get bored and put it down, then don't bother with the PM- you won't be getting enough out of it to justify the expense. There's nothing wrong with that. Some people are more analytical than others. and it's always good to keep some aside for emergencies. dura ace 7800, and a caad8/caad9 frame used...can build one helluva bike with that stuff for the cost of a new caad9 105 bike. still have money for powertap, wheels, etc. Yeah, I'm all about the used bikes now. 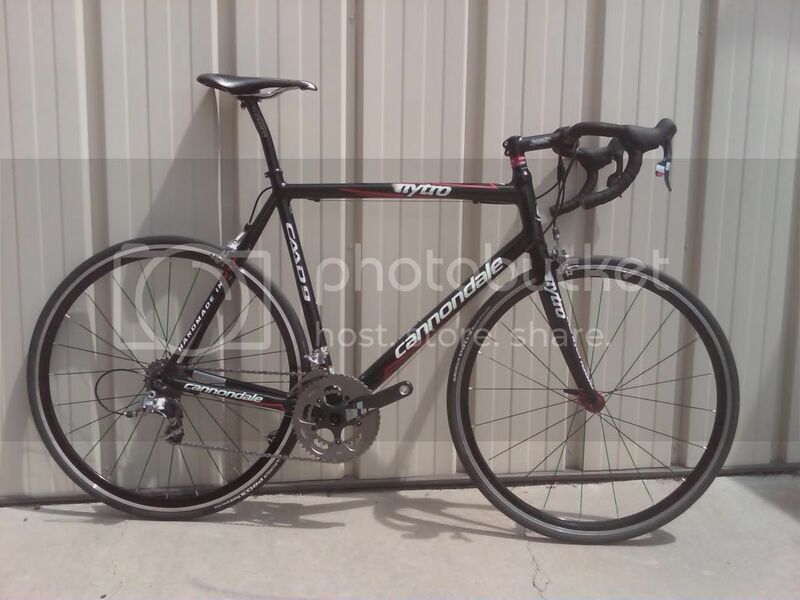 I'm on a 4 year-old Madone with D/A 7800, paid $1600 for it last year ($1350 after I sold the wheels -- already had some). No complaints at all. None. I've done two and won two on it so far. I'm also with the stock camp. Even though you could probably afford it, there are lots of other known and unknown expenses that will come up that might make you regret having purchased the Powertap. Additionally, you may not know exactly what to do with it yet, especially if this is your first season racing. Frankly, I agree with you in that it's better to race doing the "wrong" things first and then worrying about analyticals after you have a better idea of how to train. I would also just race one year without spending any extra money on coaching and the like so that you can spend more time gauging for yourself whether you really want to commit serious time and (lots of) money to this sport. I would believe that it's much tougher to determine whether one really wants to spend time on something when they have spent many more resources preparing to invest lots of time on that. Then again, I've only been "recreationally" racing for the last year, so you might want to take that into consideration. I'm friends with a LBS owner, who I'd like to support and who will give me an "employee" discount. Also I am concerned with damaging the frame in a crash and replacement is easier with a LBS. I'll read Coggans book first before committing to anything. Yeah, stock CAAD9 with PT then. How steep of a discount? Not as steep as the central park hill. I will also be working with him in the future as things pick up. I'm going to go climb one of New Englands tiny mountains today, should have plenty of time to give this all more thought. You can see tremendous improvement using a power-meter, but I don't think they're for everybody. It depends a lot on what type of person you are. If you can go out, train hard, stick to your plan and have confidence in it, then a power-meter might not help you that much. However, if you're a very data-oriented person and you're prone to over-analyzing things, or if you second-guess yourself a lot and worry a lot about over/under-training, then I think you can gain a lot by getting a powertap and learning how to use it. If you find yourself wishing that you had more data during your rides, then I think that's a pretty good indication that it will help you. This is something you need to decide for yourself; other people's advice might not be the best for you. That being said, Caad9 w/ Powertap. I'm in the same boat right now. I'm going to either buy the stock 105 or one of the lesser models and put Rival on it. I'm in love with the hoods as I have tiny hands. I will also be putting a powertap on there. Any suggestions for a specific wheelset to get the PT built into other than OP's? My understanding is the only difference between comp and pro is that you can't see power averages like NP on the head unit? Is the pro worth the $550 price difference? The only difference is that it's wired and 110g heavier (plus the weight of the wiring harness). I believe the Comp is the same exact unit as the 2008 Pro. It's a fine unit, and one advantage it has over the others is the steel freehub body won't get notched by the cassette. Awesome, looking at cycle op's site seems to confirm this. After I read Coggans book I'll decide on the PT and definitely go with the CC deal if I do go for it. Thanks WR. "My Account" icon on the upper right corner of the page. PT comp rear wheel, WKO+ and a schwaggy headband. The CAAD9 5 trigger is waiting on the bike shop owner to get back from visiting sick family. 1. POWER TAP COMP HUB (CYC139/CAMP) 1 @ $549.99 - In stock.